Rephotography is something of a fad, with people replicating viewsheds to meld historical events into modern context, to comment on past events, and even to show themselves aging. 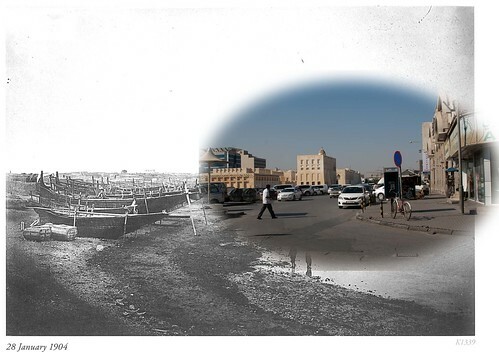 As part of the Origins of Doha project, we’ve been looking through old photographs of the city and trying to match them up their modern settings. Rephotography is a familiar tool for archaeologists; we have used Prince’s Principle to locate sites, indeed I used a digital version of it last year to locate the lost site of Al-Huwailah here in Qatar. 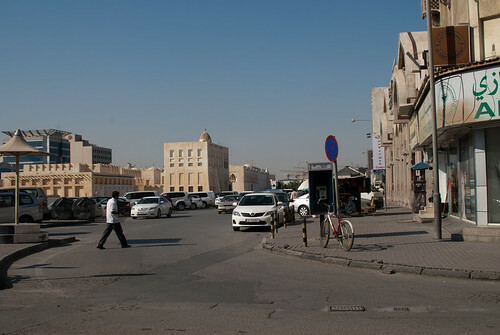 There is not much left of old Doha; anything before 1960 was demolished or incorporated into concrete block structures. There are also few older photographs available, as it was not a highly photographed place and what few exist are in private collections. Still, when have I ever let improbable circumstances stop me? 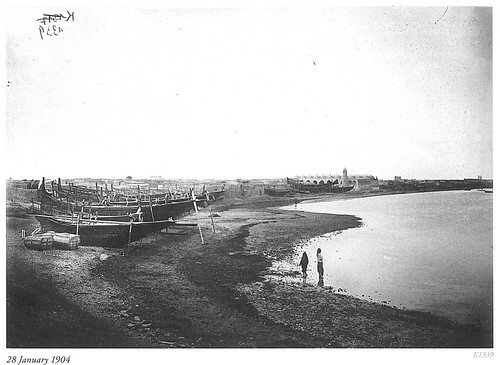 As I’ve posted above, there’s a nice photograph of the shoreline, some dhows, with a mosque in the background that we have been able to corollate with a modern mosque. The modern mosque has been rebuilt several times, but it seems to be mostly on the same footprint as the old mosque. Bingo. We printed out the old photograph and attempted to find the viewshed where the photograph was taken. The area has turned into an electronics shopping area, and is very busy with cars and people everywhere. Still, we managed to find a small gap between parked cars that matched the angle that the mosque was taken from. There was a large building directly behind us so we were not able to get the entire viewshed of the original photograph. I snapped a few dozen shots, then compared them on the screen to the original photograph. There were a few that matched closely, so I went to work with layers, masking, and the gradient tool. I’m hoping that CODA will make one of their handy online workflow videos to explain the process, as my workflow tends to involve gnashing of teeth and watching irrelevant Youtube videos narrated by pre-teens who don’t actually explain what I need to know. I ended up with something that approaches what I wanted, but is not ideal. 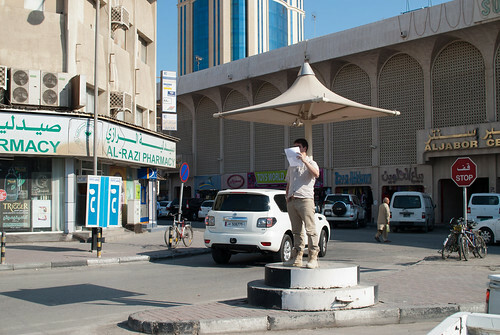 I will probably turn it into a GIF, so that people can see both of the photographs, but I may go back to take more photographs during a quiet time of day so I can stitch them together to capture a bit more of modern Doha. I haven’t had a chance to play with it yet, but if you have a smartphone available to load your photos on there is a ‘rePhoto’ app that may be useful.